"I don't regret not saying anything,'' said Fernandez, "I think that was my call. It probably wasn't the smartest thing, but this is my team and I give my life to my team. Leave it to José Fernández to come across as charming and endearing while talking about how recklessly he handled his own physical well-being. Fernández also refuted an odd statement from his attorney that came out last Friday, claiming that Fernández's injury was precipitated by a delivery change that was caused by a line drive that he took off the leg during his start against the Dodgers. "I don't think so," replied Fernández when asked if the shot to the leg altered his delivery. So stop being weird, José Fernández's lawyer. 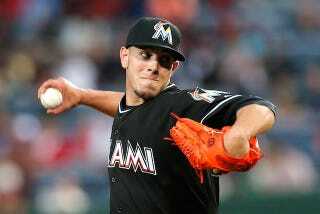 Now let's look at some pictures of José Fernández in a cast and sling, and be sad all over again.